The Tanoshiboy Chronicles: Design & Illustration Blog: Why Do Business with a Sasquatch? Why Do Business with a Sasquatch? 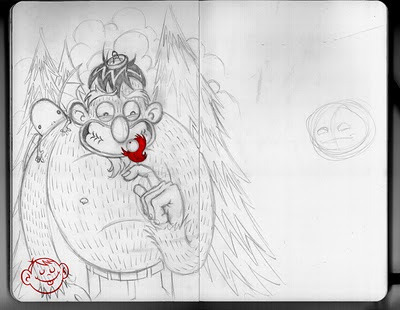 A looong time ago, I'm talking May 2009, I sketched a new character I named Señor Bigfoot. He's a latin Sasquatch, and at the time he wasn't very nice. See? Very grumpy. Anyway, he roamed the land in search of something, but what that was, he wasn't very sure. Being a lot bigger than most people, he stood out, and some people found him intimidating. They just didn't understand him or what he did, being a Sasquatch and all. So Señor Bigfoot, continued on being awkward and scared people off. One day, he ran into a Cyclopee. For those of you who don't know, a Cyclopee is a little one-eyed bird. They come in all kinds of colors and they fly here and there looking upon what other people are doing. This particular Cyclopee happened upon Señor Bigfoot and he noticed what a hard time he was having in his search. 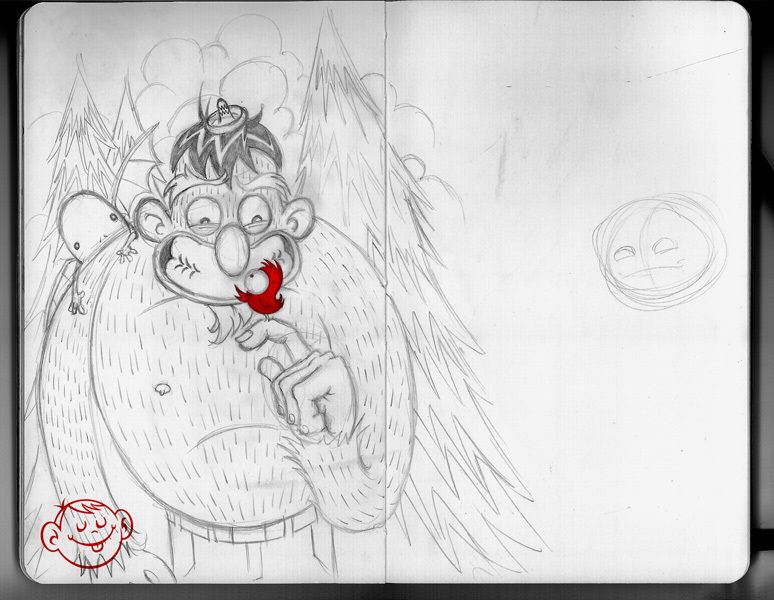 The little bird approached the giant, hairy monster and said "hello". Señor Bigfoot wasn't very sure how to handle this. No one had ever greeted him before. Cyclopee didn't hesitate in asking about his journey and what he was all about. Señor Bigfoot was very happy and he went on to become a nicer Sasquatch. He finally found what he was looking for... a friend. After this experience Señor Bigfoot had an easier time at making friends and it made all the difference. So what's the point? I was reminded of face-to-face networking over the weekend. In this world of social networking media, it's really easy to hide behind our monitors or iPhones and not have face time with other people. We forget that going to networking mixers or events are great ways to garner new business. It may be what you originally set yourself out for, but you realize that what you really need is friends. Some people show up like Señor Bigfoot did and make it a little awkward because they don't have the experience in networking or in talking about themselves, but it'd be nice if someone just came up and said "hello". Make it a point to go to at least one networking event a week. Google "networking mixers" or "networking groups" or contact your local Chamber of Commerce. Because you can read all day about networking online, but until you actually get out there and do it, you're missing out on great opportunities. I had a hard time at first, having never done any networking, but some nice people took me under their wing and I paid it forward when I got better. They've become great business partners to me, but even better friends. Our mentoring sessions have led to great conversations and leads have been coming in steadily, but only because I made the point to do it first. So go out and meet some people and if you see a Señor Bigfoot having a hard time when you get there, say "hi" and make a friend. It's always nicer to do business with people you like. If you think about it we still need that human interaction whether face to face or even via the phone and Skype. I have done this on a number of occassions with people from other countries. It is when you go past the 140 twitter chat that you get to know someone and that either strengthens the relationship or not. Glad to hear networking has worked out for you and as always really like your drawings as they do add to the post. I think I want to meet Senor Bigfoot, I bet I can make him laugh. Thanks dude. I think you should definately update him and put it on a shirt. @Susan Thank you, Susan. Thanks for mentioning skype. I've just started using it in my design business and it's been great. I hope to be doing more international business in 2011. Business is all about relationships. @Inmar Thank you! I will definitely be making updates to our bigfoot friend. Really cool sketch. You gonna finish him? I like those little birds to. I'm going to one on Thursday, but I don't think I could manage one a week! One a month maybe. Which ones do you go to? I'm so shy I have a horrible time at those things unless they serve alcohol, which tends to loosen me up a bit. Which one are you going to? I go to ones AIGA and now behance mixers plus TEAM network and I'm trying to go to REN network ones too. I had a hard time at first, but going over and over again really helped me get over it. Awesome! Love the post and the cyclopees. So sweet. Sheila, if you love them, there's plenty more posts on the cyclopees. Just look at older posts. Thanks! You gotta finish this one. I'm sure you've got a killer blog - if only I could read it. Melanie - Sorry you're having a hard time reading it. The ironic part is I have been thinking about changing the color palette -- just last night actually. So we'll see. I think I tried to convey this same aspect a while back but didn't do a very good job. A big part of networking is indeed making friends, not just building leads or connections. After all, who can you count on more in the end? Friends or contacts? I love going to networking events! You can make some incredibly valuable connections. Chambers of Commerce have monthly business-after-hour events that tend to be a great way to get started networking for anyone who is not comfortable at first. Chambers tend to have ambassadors who will go out of their way to help introduce you to people. Actually, a great way to meet people is by joining a chamber and becoming an Ambassador! I love this drawing. You have a great style.